The first time I was pregnant I wanted to do something for my baby, and so I taught myself how to crochet. My daughter is now 9 and I never stop crocheting for her and my two other children. 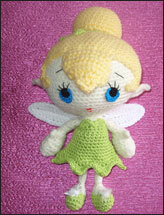 Amigurumi -- the Japanese word for knitted or crocheted dolls. 4 What season inspires you the most? Springtime with its flowers and butterflies. 6 Is there another craft you'd like to try your hand at? No, there are so many techniques in crochet! With my hook of course! My hook case, a pen and a notebook.